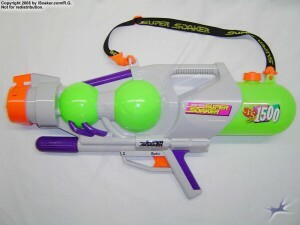 The Super Soaker CPS 1500 was released by Larami Ltd. back in 1998. While not the largest water blaster released that year by Larami, the CPS 1500 was, undoubtedly, my personal favourite blaster and one of the key reasons for me to get inspired enough to launch my first website dedicated to water blaster technology. Few blasters offer the power, flexibility, ease-of-use, unique styling, and additional features that make the CPS 1500 one of the best all-purpose water blasters ever created. The level of perfection achieved by this blaster was echoed by the fact that while the rest of the CPS line got new versions for their year 2000 release, the CPS 1500 merely got a new paint job and was renamed the CPS 1700. 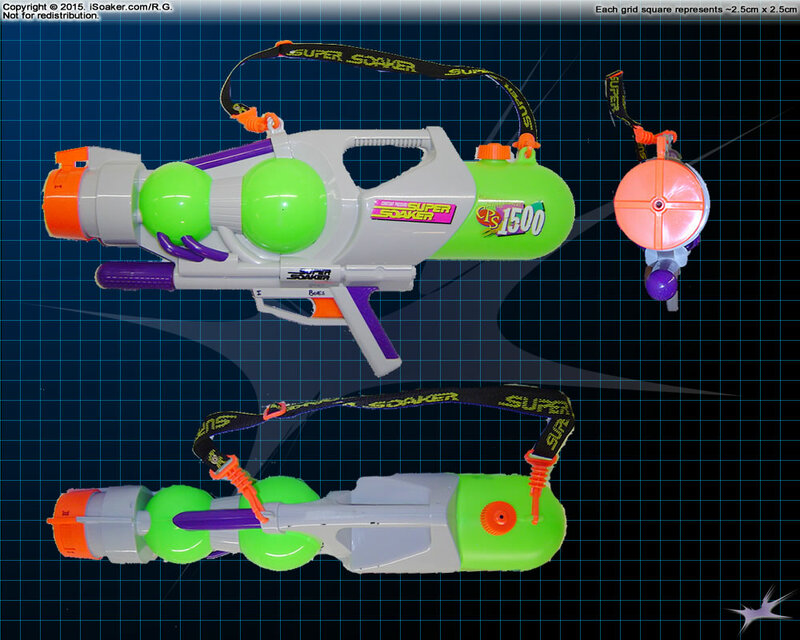 Unfortunately, when I first began buying more water blasters back in the late 1990s, I did not foresee that I would be building a website, let alone ending up reviewing hundreds of water blaster models over the subsequent years. 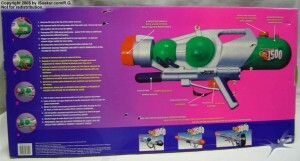 As such, the only picture I have of my Super Soaker CPS 1500 is an image of the back-side of its box. There are a couple of submitted images of a boxed Super Soaker CPS 1500 posted on iSoaker.com, but both of those pictures show packaging opposite to my own. As can be seen from the plastic tie holes on the rear of my CPS 1500’s packaging, my CPS 1500 pointed to the left in its box unlike the submitted pictures that point to the right. Why there are two versions of the packaging is somewhat of a mystery. 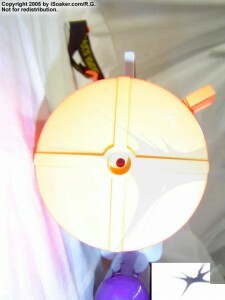 One thing to note is the when these blasters are pointing to the right in the box, the screw holes are visible. 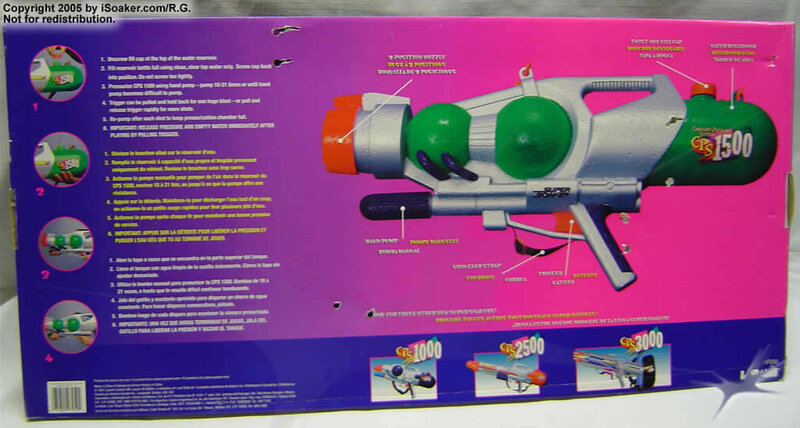 As can be seen on my Super Soaker CPS 1700 that is still in its packaging, when the water blaster points to the left, the screw holes remain unseen. In either case, screw holes visible or not, either version of the CPS 1500’s package did a great job at showing off most of this water blaster. From its top-positioned carry handle to its shoulder strap to its pump and trigger grip, virtually all of the CPS 1500 is visible apart from a small portion of the base of the trigger grip area. What is not obvious is the CPS 1500’s nozzle selector settings, more specifically exactly how large the nozzles are. While the box hid little, the Super Soaker CPS 1500 can only be truly appreciated free from the confines of its packaging. Cardboard and plastic ties aside, the adjustable nature of the strap and full size of the trigger grip region become readily apparent. 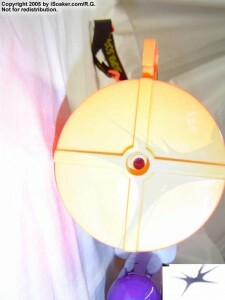 From a side-view, the nozzle selector and settings are not particularly noticeable at first glance, though the orange tab at the top of the nozzle section hints at additional functionality. Even at a 3/4 view, the nozzle selector functionality is not particularly obvious, being enclosed within the larger orange shell. However, this feature is noted on the back of the box and any curious User would look at the orange tab and cut-out section to see if something can move and move it can. Toggled to its second setting, the CPS 1500 is switched to its lower output setting, rated at approximately 5x according to its box. Output measurements place this setting more like 8x if 1x is rated at 1 oz./sec (~30mL/sec). Streams pushed out at this “5x” setting are powerful, consistent, and far reaching, outclassing the majority of water blasters available in 2015 or even within the past 10 years (and this is the lower setting). Even with this drench blast, the CPS 1500 blasts away on a fully pressurized chamber for over 4 seconds! Toggling the CPS 1500 back to its primary setting and things get much more intense. Rated on the box as well as measured by iSoaker.com at ~10x power, this larger stream is definitely more powerful and drenching than the “5x” setting. Nevertheless, the CPS 1500’s spherical rubber bladder-based pressure chamber easily pushed out beautifully potent streams and still offering a shot time of over 3 seconds. The CPS 1500’s nozzle selector, itself, is one of the best nozzle selector mechanisms ever created. A large paddle on the forward size of the blaster lets one select setting: up means 5x and to the left means 10x. 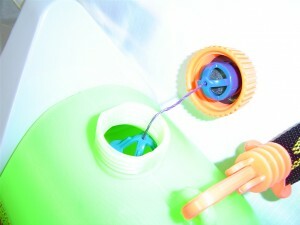 Turning the nozzle selector is easy thanks to the torque provided by the extra plastic and knowing one’s selected nozzle is easy since the position of the plastic tab is readily seen from the User’s view. There’s no need to double-check the front of the CPS 1500. Both nozzle settings are powered by the CPS 1500’s first generation spherical CPS pressure chamber. While the CPS 1500’s design makes it appear to have two pressure chamber areas, the smaller, forward green sphere is purely ornamental while the larger green sphere houses the actual CPS rubber bladder. The pump, itself, is forward mounted and non-tracked. While the CPS 1500’s pump volume pushes more water per stroke than most modern water blasters, it still takes more than 20 full pumps to completely fill the pressure chamber. However, being a CPS-blaster, it actually only takes about 4-5 full pumps to achieve a full operating pressure; the additional pumps provide additional shot time, not power. Both the pump grip and trigger grip areas are comfortable to hold. The trigger on the CPS 1500 pulls smoothly, providing one fairly good control over shot time. Tap shots can be done quite well on either nozzle setting. Of course, thanks to a large pressure chamber and a good-sized reservoir that offers a little over 3 full pressure chamber refills, the CPS 1500 gets somewhat heavy when completely filled. Thankfully, the inclusion of a shoulder straps helps take the weight off of one’s arms, distributing part of it to one’s shoulder when the strap is adjusted appropriately. As such, the CPS 1500 goes from being a little unwieldy to a near natural extension of one’s body. Beyond the strap, the CPS 1500’s design includes a full-sized carry handle that gives its Users the perfect place to support the water blaster from when refilling or just carrying around between use. It is unfortunately that sturdy handles are not a standard feature for all water blasters that carry more than 2L (~66oz) in their reservoir. 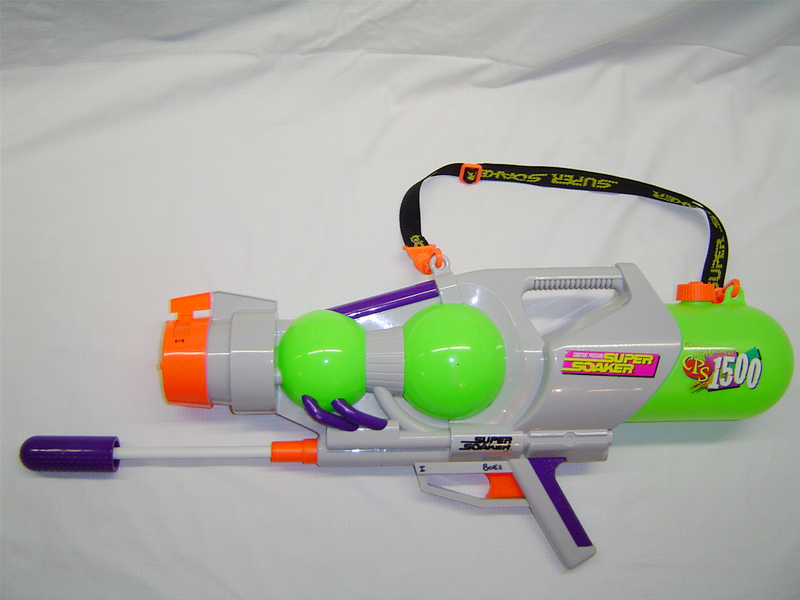 From 1998 to 2001, the Super Soaker CPS 1500 was my water blaster of choice for any larger-scale engagement and the one I used the most. It was also one of the first water blasters I decided to pick up an additional one for use. The Super Soaker CPS 1500 remains one of my all-time-favourite water blasters. 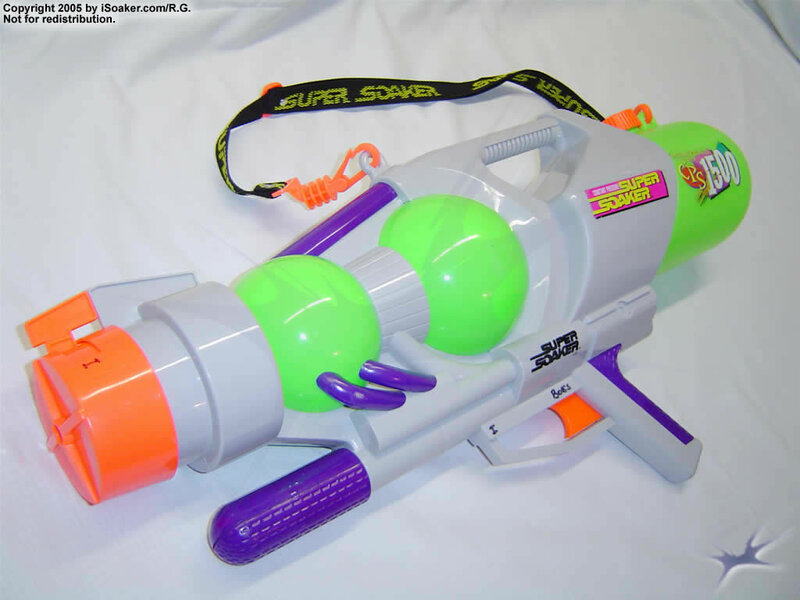 Good size, great power and performance, solid capacity, easy to fill, easy to pump, and easy to drench my opponents, I feared no other water blaster with my trusty CPS 1500 in hand, not even a Super Soaker CPS 2000 User. Fact is, the shorter, slightly lighter CPS 1500 allowed me to move faster than my opponents wielding larger water blasters, yet its 10x stream hit nearly as hard. In some ways, the CPS 1500 lead to the creation of the Super Soaker CPS 2700 (2000). Unfortunately, no water blaster since the Super Soaker CPS 1500/CPS 1700 provided the same, near perfect balance of capacity, power, range, ergonomics, and ease of use. iSoaker.com, in part, exists thanks to the existence of the Super Soaker CPS 1500. May we one day see water blasters like these again!